The Organic Council of Ontario (OCO) is the Voice for Organics in Ontario. We are the only full value chain association operating at the provincial level. We represent over 1000 certified organic operators, as well as the businesses, organizations, and individuals that bring organic from farm to plate. We work to incite sector growth, support research, improve training, increase data collection, encourage market development, protect the integrity of organic claims, and inform the public of the benefits and requirements of organic agriculture. 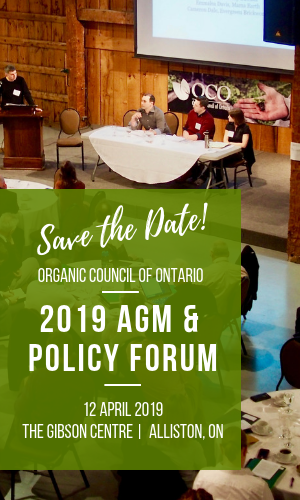 The Organic Council of Ontario (OCO)’s board drives the Ontario Organic Strategic Plan, providing oversight and direction to OCO staff and consultants. Board members are elected by OCO members, and board makeup is designed to allow for proportional representation of each link in the organic value chain. Our 2016-2017 Board of Directors. Over 50% of Ontarians buy organic products weekly. Ontario is home to Canada’s largest organic market, valued at approximately $1.4 billion in 2017. Ontario’s organic sector is expanding by well over 10% annually. There is no dedicated industry funding for the organic sector in Ontario. Ontario has over 800 organic producers and 300 processors. In Ontario, organic sales are over $1 billion, but only 2% of farming is organic. Only 50% of certified organic products sold in Ontario are produced here. For detailed information on the organic sector in Canada please contact the Canada Organic Trade Association. *Logo may be resized, but please maintain the aspect ratio. Please do not alter the logos in any other way. Dollars and Sense: Opportunities to Strengthen Southern Ontario’s Food System. Econometric Research Limited, Harry Cummings & Associates, and Rod MacRae, PhD.